Following on from John Thomas Moore’s patent in England for adjustable, portable folding chairs in 1886, he started to manufacture them in Macclesfied. Two types of deckchairs were made, the ‘Waverley’ designed to be used on ships or whilst watching lawn tennis and the ‘Hygienic.’ This was actually a rocking chair, initially designed to help those with a slow digestive systems! When manufactured the material in the first British deck chairs was believed to be olive green. However a British inventor named Atkins introduced the use of brightly coloured striped material in the 19th Century similar to that used by Anywhere Deck Chairs. Initially marketed as the ‘The Yankee Hammock Chair’ this was quickly changed to what some people referred to as the ‘Brighton beach chair’ This was intended to give a more British feel to the deckchair and to move away from the American counterpart. In the 20th century the hiring out of deckchairs on an hourly or daily basis was introduced to the Great British seaside. They were predominately used for piers and promenades and seen as a great way of bringing tourists and money into the area. 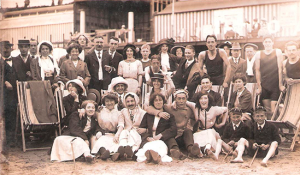 It wasn’t long before public parks and sporting venues were also providing deckchairs for spectators to enjoy events such as cricket matches and tennis. The popularity soon spread and deckchairs were then used in many public and private areas for music festivals, corporate events and weddings. Thankfully this continues to this day.